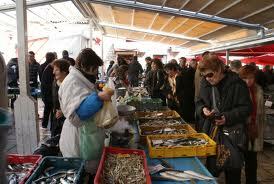 The Fish market is also one the monuments in Split. Its white stone and Secession style ironworks tend to add significant value to the offered fish. Everything that the Adriatic Sea has to offer can be found on its white tables, from the sardines and other assorted types of small fish to scarp and lobsters. Shells of al varieties are available as well together with cultivated river fish such as trout. The Fish market was expanded with an outdoor section in the courtyard but it is still too small for the city that continues to grow and whose people are accustomed to the flavor of grilled fish. The Fish market is a interesting sight for the casual passerby, primarily senior citizens but also to the increasing number of tourists who are surprised to learn that this is the only fish market not bothered by the flies, because of the smell of the sulfur springs nearby. The fish market is called the “belly button” of Marmont Street. Pazar (Marketplace) and the fish market keep Diocletian’s Palace sandwiched between them as unique monuments of everyday life. 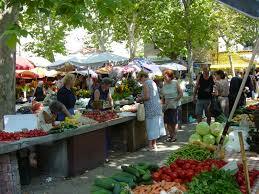 The marketplace in Spit is a special destination of the town’s guests, who enjoy its pandemonium of natural colors visible throughout the year. Until the arrival of this latest technological age that tends to impose itself on all the traditions the Pazar used to combine the mainland and the sea, people from the islands, the town and the countryside that displayed the particularities of the local traditions through games, dance and jokes, especially during Sudamija, the fiesta of St. Dujam, patron saint of the town. Pazar is located between the eastern wall of the Diocletian’s Palace, the Church of St. Dominik and the eastern part of Riva.